So perfectly cast and well-imagined that it just takes over and happens to you. It's quite an experience. “Sophie’s Choice” begins as a young Southerner's odyssey to the unimaginable North--to that strange land celebrated by his hero, Thomas Wolfe, who took the all-night train to New York with its riches, its women, and its romance. Sometimes when you've read the novel, it gets in the way of the images on the screen. You keep remembering how you imagined things. That didn't happen with me during “Sophie’s Choice”, because the movie is so perfectly cast and well-imagined that it just takes over and happens to you. It's quite an experience. The movie stars Meryl Streep as Sophie, a Polish-Catholic woman, who was caught by the Nazis with a contraband ham, was sentenced to a concentration camp, lost her two children there, and then was somehow spared to immigrate to Brooklyn, U.S.A., and to the arms of an eccentric charmer named Nathan. Sophie and Nathan move into an old boardinghouse, and the rooms just below them are taken by Stingo, a jug-eared kid from the South who wants to be a great novelist. As the two lovers play out their doomed, romantic destiny, Stingo falls in love with several things: with his image of himself as a writer, with his idealized vision of Sophie and Nathan's romance, and, inevitably, with Sophie herself. The movie, like the book, is told with two narrators. One is Stingo, who remembers these people from that summer in Brooklyn, and who also remembers himself at that much earlier age. The other narrator, contained within Stingo's story, is Sophie herself, who remembers what happened to her during World War II, and shares her memories with Stingo in a long confessional. Both the book and the movie have long central flashbacks, and neither the book nor the movie is damaged by those diversions, because Sophie's story is so indispensable to Stingo's own growth, from an adolescent dreamer to an artist who can begin to understand human suffering. The book and movie have something else in common. Despite the fact that Sophie's story, her choices, and her fate are all sad, sad stories, there is a lot of exuberance and joy in the telling of them. “Sophie’s Choice” begins as a young Southerner's odyssey to the unimaginable North--to that strange land celebrated by his hero, Thomas Wolfe, who took the all-night train to New York with its riches, its women, and its romance. Stingo is absolutely entranced by this plump blond Polish woman who moves so winningly into his life, and by her intense, brilliant, mad lover. We almost don't notice, at first, as Stingo's odyssey into adulthood is replaced, in the film, by Sophie's journey back into the painful memories of her past. The movie becomes an act of discovery, as the naive young American, his mind filled with notions of love, death, and honor, becomes the friend of a woman who has seen so much hate, death, and dishonor that the only way she can continue is by blotting out the past, and drinking and loving her way into temporary oblivion. It's basically a three-character movie, and the casting, as I suggested, is just right. 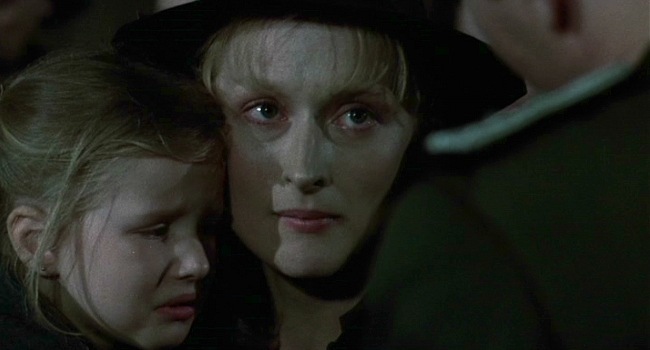 Meryl Streep is a wonder as Sophie. She does not quite look or sound or feel like the Meryl Streep we have seen before in “The Deer Hunter” or “Manhattan” or “The French Lieutenant’s Woman”. There is something juicier about her this time; she is merrier and sexier, more playful and cheerful in the scenes before she begins to tell Stingo the truth about her past. Streep plays the Brooklyn scenes with an enchanting Polish-American accent (she has the first accent I've ever wanted to hug), and she plays the flashbacks in subtitled German and Polish. 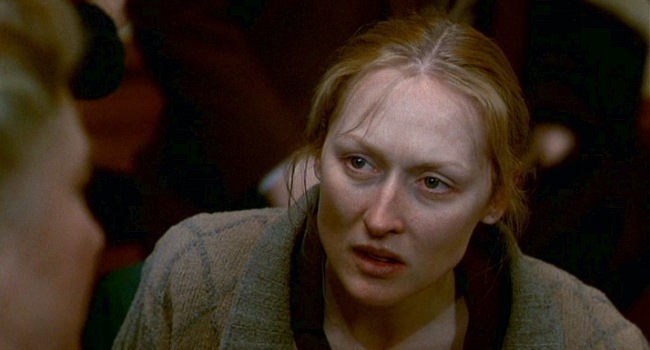 There is hardly an emotion that Streep doesn't touch in this movie, and yet we're never aware of her straining. This is one of the most astonishing and yet one of the most unaffected and natural performances I can imagine. 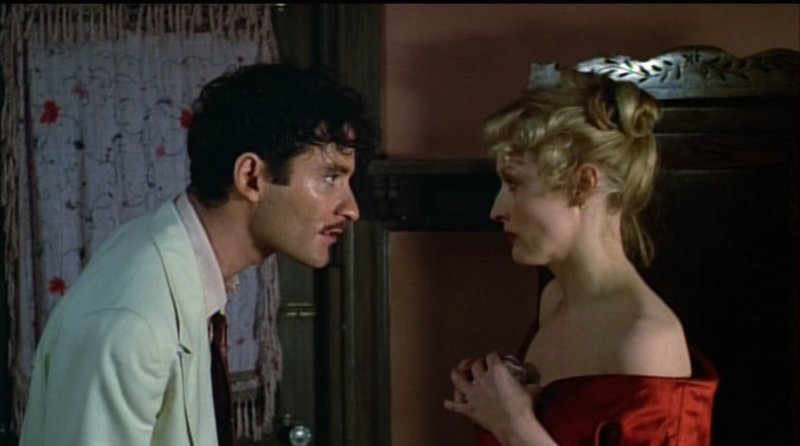 Kevin Kline plays Nathan, the crazy romantic who convinces everyone he's on the brink of finding the cure for polio and who wavers uncertainly between anger and manic exhilaration. Peter MacNicol is Stingo, the kid who is left at the end to tell the story. 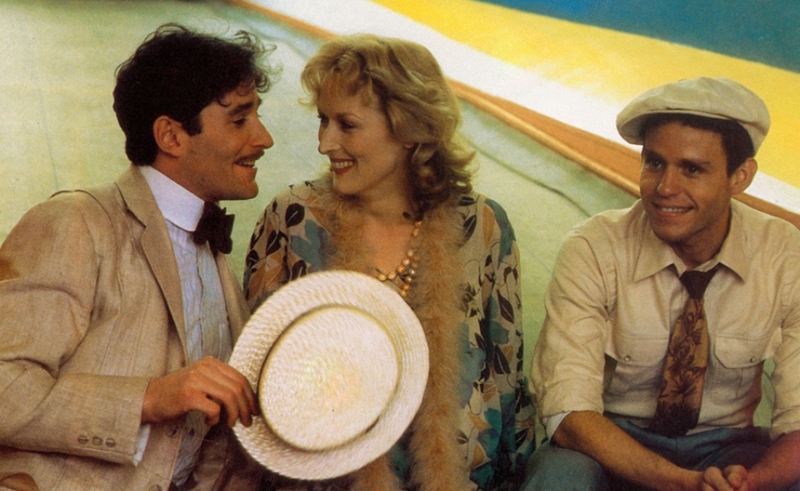 Kline, MacNicol, and Streep make such good friends in this movie--despite all the suffering they go through--that we really do believe the kid when he refuses to act on an unhappy revelation, insisting, "These are my friends. I love them!" “Sophie’s Choice” is a fine, absorbing, wonderfully acted, heartbreaking movie. It is about three people who are faced with a series of choices, some frivolous, some tragic. As they flounder in the bewilderment of being human in an age of madness, they become our friends, and we love them.